The next book in the Colette Book Club is Overdressed: The Shockingly High Cost of Cheap Fashion by Elizabeth L. Cline. For the last 15 years, Americans have enjoyed an almost unabated and unprecedented free fall in the average price of clothing. We pay less for clothes, when measured as a share of our income, than ever in history … The price of just about everything in America has climbed in recent decades—housing, gas, education, health care, and movie tickets. Meanwhile, clothing is a better bargain than ever. In 2016, we live in a “fashion democracy.” Clothing has become jaw-droppingly cheap. Cheap clothing is cuter and better designed. I can’t afford Chanel skirt, but I can afford a Chanel knock-off from Zara. In fact, Zara’s cheap enough that I can buy several—and throw them away when I’m tired of them. But at what cost? 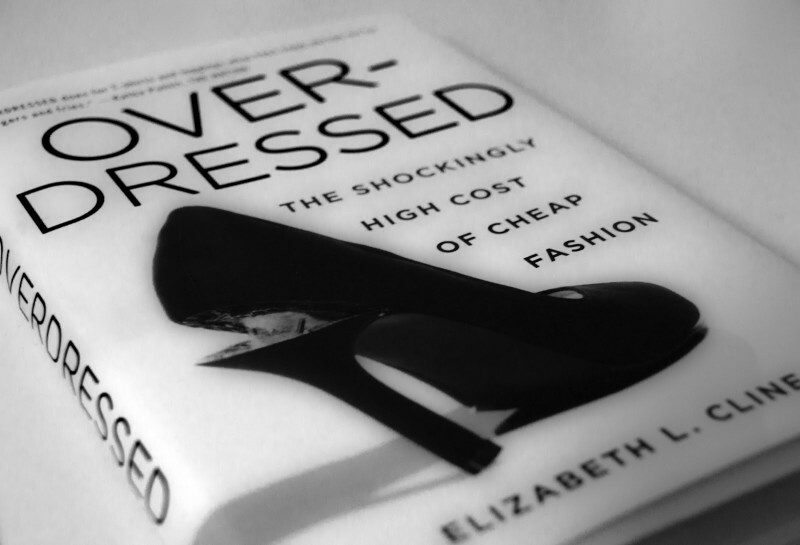 Overdressed is very readable look at the rise of cheap clothes. Cline explores how these bargains have changed the fashion industry, the economy, the people who make clothes, and the people who buy them. She travels to overseas factories, chats with YouTube fashions stars, and demystifies the decline of the American garment industry. Cline brings a lot of threads together: our love of style, the joy of creating your own wardrobe, the constant desire to buy more. After reading it, I understood more about the globalized fashion industry—and my own feelings about clothes. If you’re interested in the gritty realities of the fashion industry—in how your store-bought clothing actually happens—this book is a page-turner and a revelation. I can’t wait to discuss it with all of you! You can find Overdressed at bookstores or at your local library. It’s also available for Kindle, Nook, Kobo, and as a Overdrive library ebook (in some regions). What is the Colette Book Club? The Colette Book Club focusses on books that enhance our understanding of sewing. Every six weeks, we read a new book from any genre, from historical fiction to fashion philosophy. If you like to think about the roles that style and creativity play in our lives, you’ll love the Colette Book Club. We’ll discuss the book on this blog, six weeks from now, on April 01. We’ll announce the next book on the same day. Very true, clothing is so cheap that sometimes the fabric and materials are more expensive than buying a similar piece; not to mention the time in constructing the garment. Great book selection, I’m looking forward to know what the book club members think a bout it. I’ve read this book last year and it is both eye-opening and fantastic. The issues it ad(dresses) are a large component of why I both sew and thrift quality clothing. I’ve been wanting to read this book since it came out! How exciting that it’s the next book selection! I’m off to find a used copy now. Oh, great! I’ve been wanting to read this book for ages so I’m very looking forward to start reading it. I’m already pretty ethically convinced about making my own clothing, but I think it is going to be very eye-opening and it’s going to make want to shop RTW even less. Yay! Read this last month. I’ll absolutely include more links! I hope you’ll be back for the chat, your personal experience is fascinating. Great choice. It’s a good read and very thought provocative. Oh! I love that book! I read it a few months ago and couldn’t stop talking about it. I can’t wait for the discussion! Does this book add anything to Story of Stuff? This is a brilliant pick for a book! I’ve already read it and can truly say that the phrase “couldn’t put it down” is a fit for this book. Ms. Cline takes readers behind the scenes of fashion production. Not a dry topic at all. I too have read this book and even did the 1 year no buy because of it. It has a permanent place on my bookshelf. Wow! I’m really impressed by that! Okay, I’ve reserved a copy at the library; I remember seeing this one after it came out. But does the book discuss textile manufacturing? Sure, we can make our own clothing, but the origin of the cloth is also an issue. And very, very little fabric of any kind is made in the first world. I wonder the same thing, and sourcing sustainable fabrics/making your own would be ideal… but for me it’s about choosing your battles! Making our own clothes is a fantastic start to ethical fashion, but is it realistic to try and knock down EVERY unethical barrier in our way? No, you’re so right! I completely believe that awareness is often all we can take with us while continuing to live in the world. And when able to make a choice that might affect positive change (either personally or for a larger collective), we do. Even if that means an occasional sacrifice. Now if I could just find a way to stop having to buy “cheap” children’s clothing. They grown out of them so fast and boys’ consignment is just not as available as it is for girls. Little boys are so hard on their clothes. And no, I don’t make those; I can’t take the time or I’d never be able to do things like……work. I’m reading this right now! It is hard to reflect on my past practices when it came to buying clothing. I have slowly been reducing the amount of clothing that I buy over the past few years but I know that I can do better. Learning to sew has not only created the potential for clothing that actually fits, it has also opened my eyes to the amount of time and energy needed to make good quality clothing. I think I am driving my boyfriend insane as I read through the chapters and stop to tell him about everything I’m learning. I’ve really been wanting to read this book. I’ve seen the documentary “The True Cost” and felt so hopeless. Does this book dwelve deeper into what we can do to create change? I have 3 young kids and I try to sew for us as much as possible, but I only have so much time. Plus, where the fabric is made is just as horrible. Being aware of a problem is certainly a start, but we need to know how to not contribute to the problem and actually help alleviate it entirely. I have already read this book and found it fascinating and rather depressing. It makes me want to sew all the more but it also makes me crazy. One, I don’t think clothes are cheap even in the cheap stores i.e. H&M etc. but I do think they are cheaply made,, ill fitting, and sad. I also think that there are lots of people out there who can only afford these clothes and they are truly being ripped off. Our youth culture is driving this have to have it now and want to replace it tomorrow. So very wasteful as well as driving the next ME generation to think they can have it all and have it now. And when you think of the sweat shops in the third world countries it is mind boggling. This is a wonderful book and a very approachable read on the subject. I am sure it has opened many people’s eyes to the process of fashion and its production. Great choice. I read this book last February and really enjoyed it. It was a great starting point for thinking about the impact my purchases make in the world. It will be interesting to see what everyone thinks! Great choice! I have read some similar books, such as “Not Buying It” by Judith Levine, which actually helped lead me back into sewing after a long hiatus. I wonder if this book will also be trans-formative. Turns out my local library in Uppsala, Sweden, havet a copy, but there is a que until Middlesex of march. So mayby I wont make it. But the topic inspirerad me to pick up an unread book from my ön shelf: “To Die For – is fashion wearing out the world” by Lucy Siegle. I love to make that kind of fond in my own home. Has anybody read it? I read this book for my Apparel and Textile Industry class last semester. Between that class and reading this book was a huge slap in the face for me, regarding how clothes were made. It has made me reconsider all my clothing and textile purchases, along with what my future career might be. Thank you for making this book apart of your book club. More people need to be enlightened on this subject. Oh yeah. I was in fashion school when I read it too. It definitely made me think hard about what it means to work in the fashion industry. (I mean, no industry is impact-free, but fashion has some particularly damaging and unnecessary practices). In the end it was moot because my city doesn’t have a ton of fashion jobs, and it made more sense for me to stay in my current job as a librarian. Sadly, it does. Perhaps we can see the fashion industry’s waste problem change for the better one day. Ha! Librarian is my “backup job.” I’ve worked in nothing but libraries for the past 8 years. When I finish this degree, if I don’t magically find a job, onward to my MLS. Elizabeth Cline’s book is fantastic. I’m happy it’s the club’s next title! There were a few more articles about this particular sweatshirt on the Business Insider website, but it really hits home for the folks who have read this book. I just finished chapter 4, when they talk about how the quality and weight of clothes is going down in order to meet the price demands. If you don’t believe that, consider that a sweatshirt that is good quality and weighs 2 lbs, made national news! It seems like people are still complaining about the price, but the company is holding firm. Any thoughts on this hoodie and how it relates to the book? PS. Anyone else thinking about stealing the specs for a homemade version? It does look well designed. Thanks so much for that link! I really like the detailed breakdown of the production process for this hoodie. This is such an important subject to discuss! I will definitely read the book! I would also highly recommend a documentary called “The True Cost” (2015) talking about the same issue. I read this a few years ago – it was my fav read for the year and has inspired many lifestyle changes and helped me find so many different initiatives doing amazing things such as Alabama Chanin. I read the book about a year ago and I loved it along with a couple others in the same genre. It was very interesting to me as I have never been a clothes addict, but could see where it affected me as well. I recently downloaded it to my kindle and as a person who sews, it really got me to thinking of how fabric is made and if we mimic the same cycles(Practices) in the sewing community, of over consumption in general. I always read about having loads of fabric and patterns, but where exactly does that fabric come from? You can more than likely trace the pattern source but do we over consume from there as well? Either way I am excited about the book discussion.